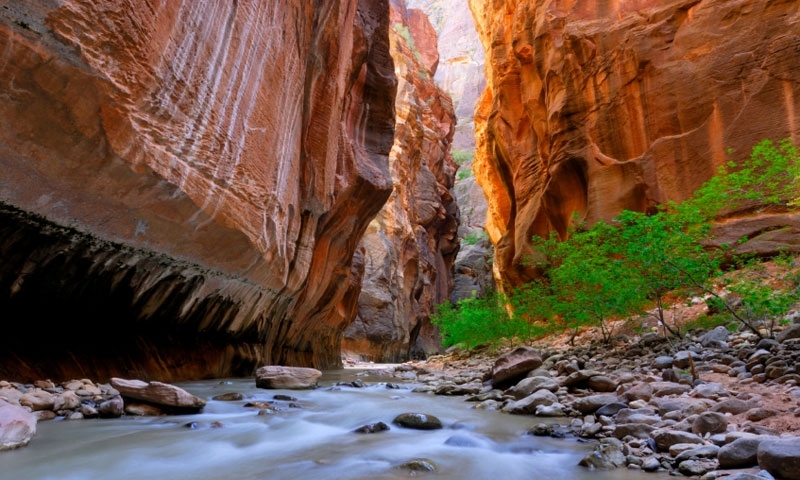 Don’t miss these top attractions in Zion National Park. Located in the southwest corner of Utah, Zion National Park is Utah's oldest and most popular national park. Offering spectacular canyon vistas and hikes, a unique geology, bird watching, and endless color, it is no wonder why 2.5 million people visit Zion throughout the year. It's always nice to have ample time to explore any park, but many visitors tour Zion in just a few days. Regardless of your time frame, be sure to include a side trip to this spectacular canyon country; Zion is not to be missed! If one day is all you have to spare, here are a few must-see attractions! These short hikes along the scenic Zion Canyon drive not only provide opportunity for amazing photos, but also give one a glimpse into Zion's geology, flora, and fauna. Begin at the Zion Canyon Visitor Center, located just before the south entrance. Here you can learn more about Zion's unique geology and desert ecology, as well as catch the Zion Canyon Shuttle. Not only is the Canyon shuttle free, it is also the only way to access the popular Zion Canyon area from April to November. As the shuttles run consistently throughout the day, take your time to explore these areas. Although you may want to stop at previous shuttle stops for some photos, be sure to explore the Emerald Pools, located at the Zion Lodge stop. Known as a ‘family-friendly- hike, this collection of trails meanders among three pools, waterfalls, and streams. Continue up the canyon for a picnic lunch at the Grotto stop. Here you will find restrooms, picnic tables, water, and the trailhead for the famous Angel's Landing hike. After lunch, continue up to Weeping Rock. This short, paved walk ends at a rock alcove with dripping springs. In spring and summer, the hanging gardens of wildflowers provide for a great photo. The last shuttle stop is also a ‘must-see'. Here hike along the Riverside Walk along the Virgin River and at the bottom of the canyon. It is also the entrance of the famous Narrows area. Depending on how quickly the hikes take and time of year, you may have time for a drive along Zion-Mt.Carmel highway (See below) for a colorful desert sunset. If you have an extra day, hike Angel's Landing, known as Zion's signature hike. Although it is steep, and not recommended for those with a fear of heights, this 2.5-mile hike (5 mile roundtrip) ascends 1500 feet to a rocky spine. Bring your lunch and enjoy stunning views of Zion Canyon. Depending on how long you enjoy the views and your hiking speed, Angel's Landing can take between 3-6 hours to complete. Start the day early to avoid heat and ensure light for a scenic drive later in the day. A less strenuous alternative for the morning is ahorseback ride along the West Bank of Virgin River. Along the way you'll be able to view the Three Patriarchs and Beehives up close, as well as experience Zion's diverse plant life such as cactus gardens. A great way to end your time in Zion is to leave the park via the Zion-Mt.Carmel/Route 9 highway and the east entrance. This scenic byway highway links up with highway 12, eventually leading to Bryce National Park. It offers magnificent views of canyons, a variety of geologic features, such as Checkerboard Mesa, and an impressive array of color. There are multiple pull-offs and hikes along way. If you chose the horseback ride and have extra time, stretch your legs on the Canyon Overlook hike, which ends at the breathtaking viewpoint of lower Zion Canyon and Pine Creek Canyon.